I've been in touch with Royal Farms and they are preparing for a special exception hearing with the Administrative Law Judge. Even though this is still a public hearing, it's more of a formality since gaining approval through the CZMP process. The judge gives his ruling in approx. 2-3 weeks. Once approval is given then Royal Farms has approx. 6 months of filing of permits with Baltimore County. The build out can begin. I will keep you updated as I get more FYI. the acreage between Elmwood Elementary and Overlea high School and Double Rock Park. because there were no guaranteed plans provided, nor did I believe another convenience store at that location would be a good fit for the area. The Royal Farms project was well supported and I truly appreciate your support during the process. 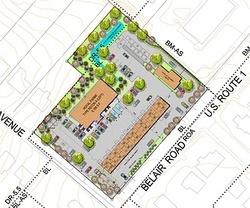 This project will mean a great deal to the greater community as the revitalization of Belair Road moves forward. I was very pleased to protect and preserve your parkland and open space for generations to come. Please share this good news about the rezoning for the Royal Farms and the downzoning of your parks in your social media and print outlets. Thanks to everyone who was part of the CZMP process. Zoning changes create a lot of conversation and everyone did a fantastic job of representing their communities. The community association presidents did a great job of presenting their views to the planning board and to the county council on all zoning issues within their communities. Everyone has their opinion and not all of agree, but the fact that you care enough to get involved is the most important factor. Not everything went the way you might have wanted it, but the planning board and the council have much more experience at looking at at ALL the factors that go into a zoning change and how it benefits the community and Baltimore County on multiple levels. As you know I was the only one to speak on behalf of the zoning change allowing Royal Farms to come to Overlea Fullerton and a huge THANK YOU to all the business and community members who signed the letter or sent their correspondence to Councilwoman Cathy Bevins. YOU made the difference in helping to revitalize our business corridor and new business brings new business! Looking forward to seeing what comes next! Duis aute irure dolor in reprehenderit in voluptate velit esse cillum dolore eu fugiat nulla pariatur. Excepteur sint occaecat cupidatat non proident, sunt in culpa qui officia deserunt mollit anim id est laborum. Sed ut perspiciatis unde omnis iste natus error sit voluptatem accusantium doloremque laudantium, totam rem aperiam, eaque ipsa. My name is Donna Bethke and I am president of the Overlea Fullerton Business & Professional Association. Royal Farms will be bringing revitalization to a corridor that is “dying”; job creation; it will help stimulate the economy in Overlea Fullerton and it will bring visibility to our existing businesses. Royal Farms is a viable business who has an excellent reputation in not only our county, but surrounding counties as well; and most of all the type of business that is the most user friendly to our neighborhood. From our teenagers who are looking for a job, our neighbors who need a place to “dash in” for a loaf of bread; our seniors who don’t cook as often and our busy families who need food on the run; our business folks who travel our corridors daily and all of us who want affordable gas prices….. Royal Farms bring a user friendly business with a stellar reputation. Click here for full document presented to the County Council on June 14, 2016. On March 29th at Parkville High School the 1st phase of the CZMP process was held by the Baltimore County Planning Board for the 6th District. I spoke on behalf of the OFBPA in favor of Issue 6-002 (Royal Farms). I have spoken to many residents and many businesses who are in favor of the Royal Farms who think our business corridor needs this influx of new business and jobs. Nothing has come to our corridor in decades that is bringing an upgrade look, new business and most of all jobs! The great chicken and cheaper gas prices are a huge PLUS as well. Click here for the letter that I presented to the planning board. This letter with additional signatures from neighbors and businesses will be submitted once again before April 19th to be added to our packet. The final public hearing will be on June 14th at Parkville High School and heard by the County Council who has the final decision. All those who travel in our area, visit family, grew up here or just "pass through" , as well as live here all have a voice and it all counts! How can you show your support? * I am collecting signatures and have a form that can be signed- call me and I will stop by with it or you can stop by my house. * An email from you stating your support and includes your complete contact FYI can be sent to me. * A letter can be sent directly to Councilwoman Cathy Bevins by June 1st. OFBPA is looking at Royal Farms to continue the revitalization of our corridor. People don't realize that once David S. Brown refaced the Beltway Plaza it then prompted the property manager of the plaza across the street to reface theirs ( hence the new red and blue paint, cute little lamps and new signage. Royal Farms brings a fresh look and the possibilities are endless of what is added to our corridor. Business brings business and empty lots and empty buildings are not what OFBPA wants for our corridor. Royal Farms coming to our neighborhood? OFBPA is in favor of this Baltimore based developer and owner coming to our neighborhood. Royal Farms has a good working relationship with Baltimore County, will employ 40+ as well as bring a new look to our corridor. Belair Road is known as the "gateway from Harford County to downtown Baltimore". The traffic is already here and this will make it very convenient for folks who are travelling every day. Also folks stop, they notice what is around them and this can only help our small businesses . Our beltway exit is the last one before I-95 with no easy way to get gas and food. Royal Farms contacted Linover Improvement Association and after doing a presentation to their board about bring a RF to our area which would require a zoning change. RF was then invited by Linover to present at a community meeting where approx. 75 people attended including Delegate Christian Miele and his aide Patrick, and Rita from Delegate John ... View more Cluster's office. I also attended not only as a resident, but to represent the OFBPA. Royal Farms representatives included their Director of Real Estate, their attorney and two engineers. They also brought to drawings on a layout drawing and one of a finished rendition. The current zoning is BL .2DR and asking for it to be rezoned BL AS. Even if zoning approval is granted, RF still needs to file appropriate application with the county. Sidebar note: 8 years ago Linover got zoning changes along our corridor and downgraded the commercial zoning on our corridor that seriously affected owner’s property values and their livelihood and basically their 401K’s. Business owners were not in favor of the zoning change and testified at the county hearings to no avail. Proposed site is 5,000 square feet. Building will be smaller than current building. Car Wash will be on the deeper side near Carrabba’s. There will be approx. 40 jobs and they hire locally. Looking to open in 2018 (zoning process, ends in Sept.; if approved access to property in October, CZMP final maps in November, exceptions, county permits, etc. will take RF well into 2017). 6pm—must sign up to be able to “speak/testify” Allowed 2 minutes to speak. NOTE: OFBPA will include your letter or comments with our packet.